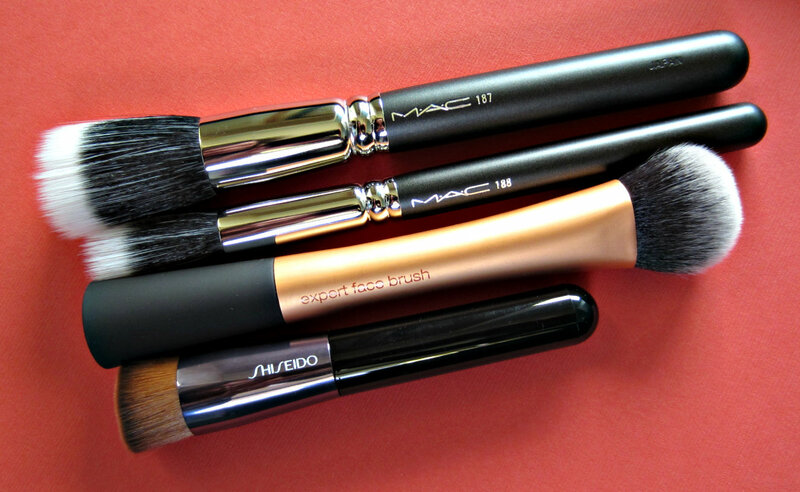 The right tool can make a world of difference in your make up application, and I've found that the majority of times, my higher-end brushes perform better. Every now and again, I discover a brush that does a superior job, even though the price may lead you to believe otherwise. The Real Techiniques Expert Face Brush is a good example of a product that completely dispels the saying that you get what you pay for. 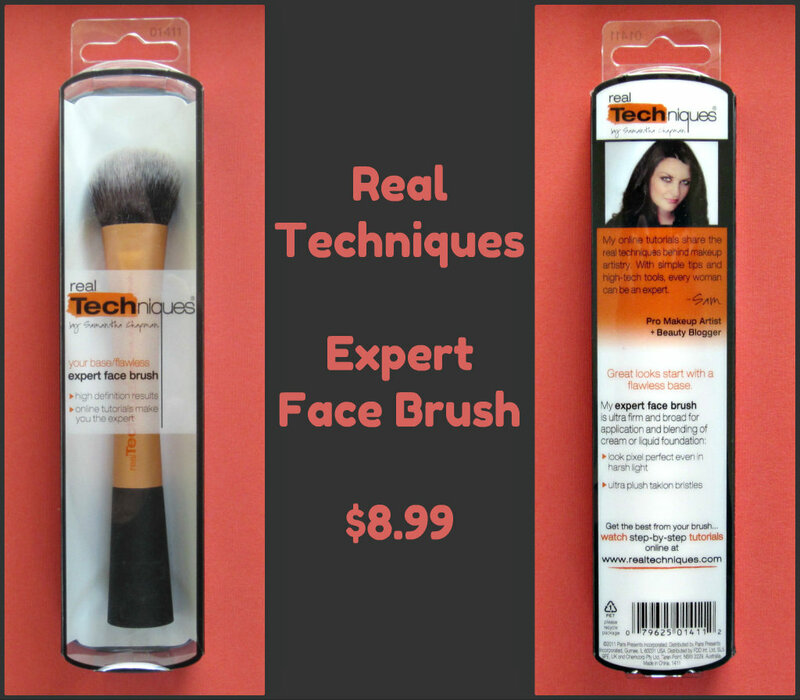 Priced at just $8.99, this brush is top quality and has rapidly become one of my favorites for applying my powder foundation. I seldom wear liquid foundation, because I never seem to be able to apply it correctly. 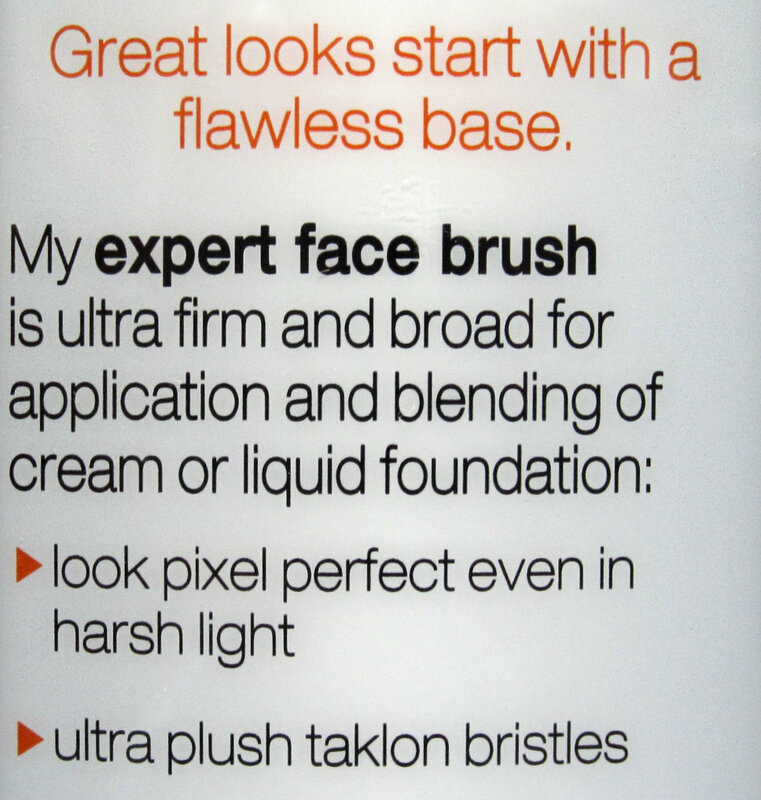 I just ordered another Expert Face Brush to use solely for liquid foundation. I'm excited to think that maybe, just maybe, this will help in my application so I'll be able to wear more liquid foundations that look flawless. The brush is aluminum, so it's lightweight. The tapered handle is comfortable to hold and easy to manage. 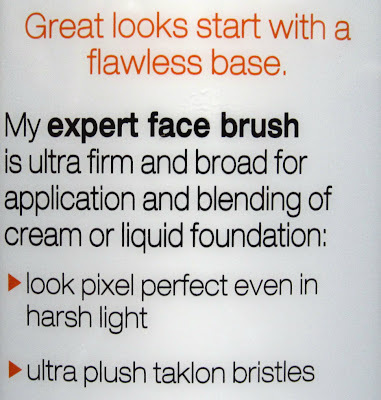 The information on the packaging (below) recommends this brush for the application and blending of cream or liquid foundations, but don't think that's all it does! 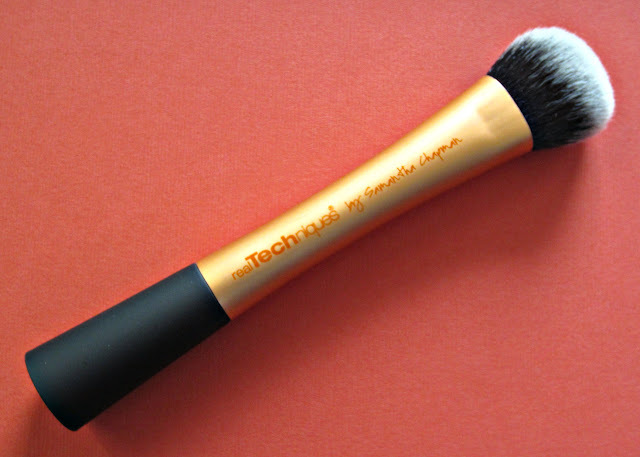 This multitasker works well for blush, bronzer, blending, and buffing. The synthetic bristles are very dense and firm, but they are unbelievably soft. The shape of the brush head gives me great control and precision, especially around facial contours. I haven't noticed any shedding, and it's still just as soft as the day I bought it, even after a couple of washings. This photo gives you a comparison as to the size. I find myself reaching for the Real Techniques brush over my MAC 187 and my Shiseido Foundation Brush, and I don't remember the last time I used my Sonia Kashuk Flat Top Brush for buffing. This is a very impressive brush, and the price makes it even better. I still love my higher-end brushes, but this one works just as well and in some instances, better. It also saves me time because I can use one brush instead of two or three for various products. I'm especially happy with the way it "finishes" my powder foundation. My higher-end brushes always outperformed my lower-end brushes for powder application, because they almost eliminated any "powdery" look that I always seemed to get from lower-end brushes. There's no almost with the Real Techniques Brush. It completely eliminates any look of powder, so I don't feel like I always have to set it with a finishing spray for that more flawless look. I don't have any other brushes from Real Techniques, so if you have any thoughts about them or any that you recommend, let me know in the comments! I picked mine up from Drugstore.com, but they're also available at Ulta, select Walmart stores, iHerb.com, and other etailers. Good to hear that you love this bruash too! I'll have to check out the blush brush. i just replaced all of my brushes with real techniques. i love them! they are such great quality especially for the price. my favorite is the eye set but i also have the face set, eye shader and powder. You have a lot of them! I saw some of the sets at my WalMart a couple of months ago, but I think I need to check them out again with all of these recommendations. I have a bunch of the Real Techniques brushes and love them all. Glad to hear everyone seems to like them. I thought maybe just a few might be good, but it sounds like the entire range in well-loved. I so love this brush. Before I am using Mac brushes but due to its being pricey, I decided to find other else and this is my choice. I have never regret choosing it. I was pretty happy with my MAC brushes too, but this one from Real Techniques was a very pleasant surprise. I think they are really affordable and the gold looks so lux! Maybe I should switch over to Real techniques too. Very affordable, for sure! They do look really nice too...I like the aluminum instead of plastic. I also like the way it feels, substantial, but not too heavy. Agree! 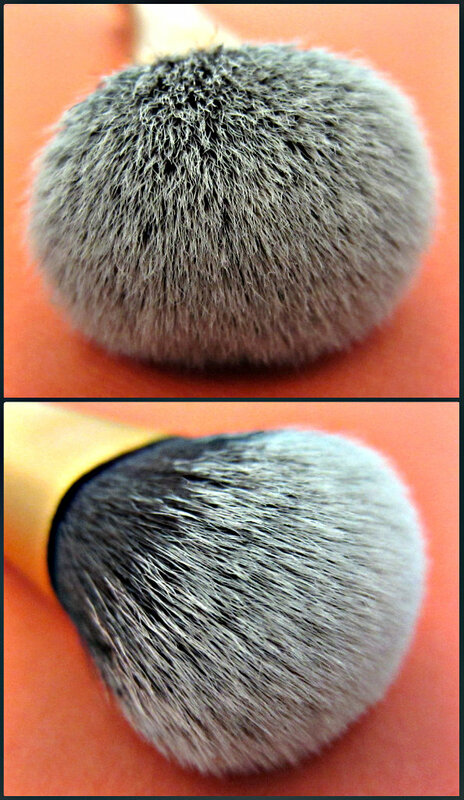 I've never used such a well-made, versatile brush. Thanks for the brush recommendation! I'll check it out next time I'm at Ulta...may look at Target as well. I'm reading these comments and it looks like Real Techniques has a good reputation among makeup users. I just pinned this to Pinterest as well. Have a great day!